A healthy rate of weight loss is about 1 to 2 pounds a week. One pound of fat is equivalent to about 3,500 calories, so to drop 2 to 4 pounds in two weeks, you'll need to trim 7,000 to 14,000 calories from your diet. You can spend hours at the gym each day to burn off those extra calories, although making changes to your diet can also help. Drink more water and stop consuming high-calorie beverages. By the end of those two weeks, you could be a few pounds lighter. In 2010, research was presented at the 40th National Meeting of the American Chemical Society regarding water consumption and weight loss. Researchers discussed their study, which included two groups of adults. Both groups followed a low-calorie diet, but one group also drank two 8-ounce glasses of water before meals. 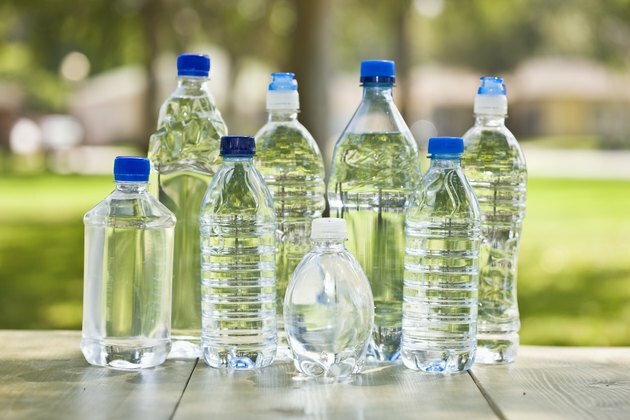 At the conclusion of the 12-week study period, researchers observed that study participants who drank water before each meal lost on average 5 more pounds -- 15.5 pounds total -- than members of the other group. They claimed that drinking water fills up your stomach without adding calories, making you want to eat less. If you followed that strategy for two weeks, you could lose more than 1 pound a week. Get rid of all other types of beverages in your diet and stick to drinking plain water or seltzer water instead. A 12-ounce can of regular cola has over 130 calories, while a can of lemon-lime pop or root beer has more than 155 calories. If you normally have a couple cans of soda each day, you can shave off 260 calories or more daily just by drinking water instead. By the end of two weeks, you'll avoid consuming an extra 3,640 calories or more -- that adds up to about 1 pound of body weight you can lose. Juices are something else you'll want to skip until you meet your weight-loss goal. An 8-ounce glass of juice contains at least 120 calories. If you nix your morning juice for two weeks, you'll save yourself another 1,680 calories, or approximately half a pound. Sometimes hunger is mistaken for thirst. Your brain tells you that you need something in your belly, but in reality, you're just a bit dehydrated. The next time you get those mid-afternoon hunger pangs and feel tired, drink a bottle of water, do a short task, then see if you're still hungry. You might not really need a snack after all, helping you shave a few calories from your diet for the day. If you can skip your usual 250-calorie vending-machine snack just by staying hydrated, that adds up to 3,500 calories, or 1 pound, after two weeks. According to the Institute of Medicine, the recommended amount of fluid is around 13 cups for men and 9 cups for women. This amount includes water you drink, fluid from other beverages and moisture from food. You can certainly drink more than this amount, but just don't go overboard. Although it's rare, it is possible for you to consume way more water than you need. This can lead to a condition called hyponatremia, which causes your blood to become diluted, minimizing your electrolyte levels. In severe cases, hyponatremia can affect your heart and muscle functions, possibly leading to a coma. Columbia University's Go Ask Alice! : How Many Calories Does It Take to Lose One Pound?